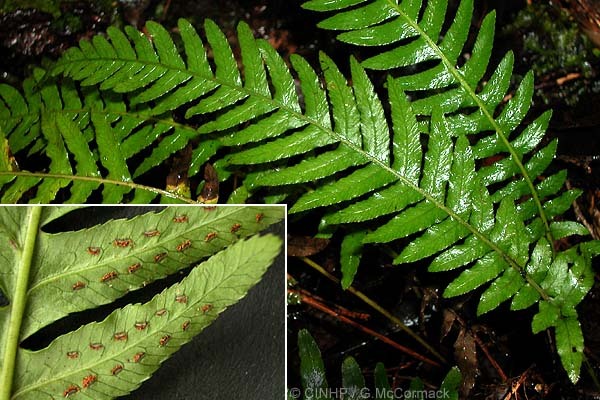 KEY FEATURES: An erect fern, with narrow, fronds to 50cm. BASE tufted. FRONDS to 50cm; STALK slender to 20cm, a few brown hairs, and a few low 'spines'. LEAVES (=pinnae) arranged ladder-like, opposite to alternate, lance-like, to 4x1cm, finely toothed; basal ones short-stalked, rest with base fused to midrib. SPROANGIA two broken rows, one each side of leaf-midrib.